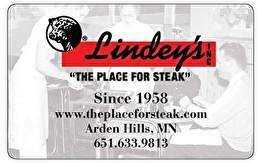 Nestled in woody Arden Hills, Lindey's Prime Steak House is reminiscent of a northern cabin from the 1950's; a unique atmosphere that is both casual and warm. The steak-centric menu is clearly a meat-lover's dream come true. Lindey's offers steak, steak and more steak. Sides are a simple but tasty affair: pickled watermelon rind, salad and garlic bread to name a few. Lindey's fully stocked bar, affordable menu and attentive staff tend to turn first time diners into regulars and for good reason - every experience is delightful and delicious. For balance inquiries call the phone number to a Lindey's Prime Steak House's location below.